Happy Monday morning y'all! Hope yours is going well! It is cold here in Texas this morning and I actually had to turn the heat on for the very first time last night. I wish it would stick around but alas the warmer weather I am sure will be back. I must say it was kinda tough getting back into the swing of things this morning after being off for a week. We are already counting down the next three weeks till school lets out again! Here is what our mantel looked like last year! It may very well look the same this year. Not sure yet. The major difference I am thinking will be the new surround tile and the wood floors! I can not wait to see it all pulled together. 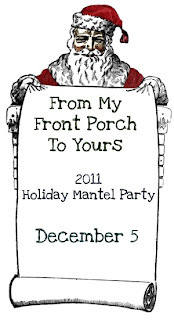 I am sure some of you are already ahead of the game but for those of us who are not I wanted to give us a week to prep for The first annual FMFPTY Holiday Mantel Party! It will be next Monday Dec 5! You can link up last years vs this years mantels, just this years mantels, or if you do not have a holiday mantel you can share any holiday display! I will have the link open next Sunday evening starting a 8pm so get your pictures taken and come on back by for some holiday fun! Please feel free to grab the party button on my side bar. I have the button created but not the html yet. I always forget how to do that so you will just have to grab the pic and insert my blog address for now pretty please. I have also included my holiday playlist on my sidebar! No worries though it will only play if ya tell it to! Have a grand one y'all! So pretty!! I love it all...can't wait to see this years! Pamela, this sounds like fun! I'd love to party with ya! Thanks for hosting! Sounds like fun! One is done...now if only I can find time to do the other! Your mantle last year was so pretty! Cannot wait to see it this year! I still love those nutcrackers! I want some!! I am decorating today too with it dreary and raining outside and snow on the way, but no accumulation. Pretty! Love the how you put the chair beside your fireplace. Everything looks so cozy and inviting. I'm in the process of decorating too but it's going slowly. I need to kick it up a notch! Still tweaking my mantel, Pamela! I have a different size here in the new place and I have to rethink what I'm doing here. Last years mantel was very pretty! 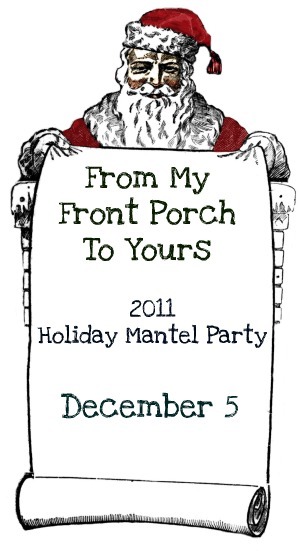 I am going to try to join your mantel party....looking forward to it. Pamela, I like your new Christmas blog header! I'll have to take pictures this week so I can join your mantel party. I started decorating the mantel but it's very simple right now. We're going to get our tree next weekend so I might put more up after that. Love your mantel from last year ... so whimsical, festive and beautiful !! I know that this year's mantel will be just as wonderful !! Your mantel from last year looks beautiful. I have changed mine out a bit this year so I will certainly be linking up next week. Your blog is beautiful and I'm following you now. Patty btw...thanks for the beautiful Christmas music! Oh Pamela, I am so glad you are doing a mantel party. I will definately be here!!!!!! Thanks for hosting the mantel party. I will be there! !